Approximately 3.2 acres of land at the end of Alder Creek Road in the Hiddenbrooke Community were committed for a local school and park during the planned development process. In April 2012, the City and the Vallejo Unified School District agreed to a long-term lease agreement which will allow for the use of the school district’s land for a community park. The City is using park dedication funds to design and construct the facility, while the Greater Vallejo Recreation District will be responsible for the operations of the facility after construction. The City held a design charrette in September 2012 to gather input from the neighborhood and community stakeholders about the features most and least desired within the proposed park. 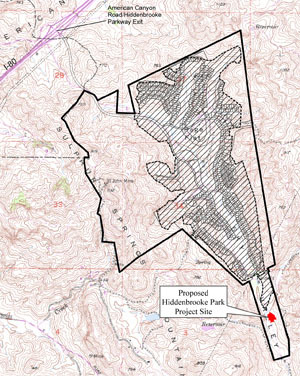 Preliminary plans were brought back at a meeting in December 2012, which were used during the environmental permitting and regulatory process. The Initial Study/Mitigated Negative Declaration was available for review and comment through May 24, 2013. Approximately two-acre of this land is being used for the park, which includes the desired features from the meetings. The park design was refined and finalized, with the schedule to bid the grading in fall/winter 2013. Park improvements are scheduled in spring/summer 2014 for a late summer 2014 opening. Status: Grading started in mid-February 2014; Final design and unit plan processing in preparation for a spring bid opening and summer construction. Go to the following location to access project files.